"An average annual removal of 700,000 to 800,000 of the weakest of a million babies means an increase in the power of the nation" so said Hitler in a 1929 speech. A perversion of Darwin's 'survival of the fittest', this philosophy of racial hygiene and a vision of a 'purified' German people was to lead to the darkest nights of the human soul. The most notorious of these was, of course, the Holocaust, in which six million Jews were incinerated in the ovens of death camps. Somewhat less well known is Aktion T4, in which German doctors were given authorisation to select patients judged "incurably sick" and euthanise them. This programme became a way to excise disabled children from Hitler's brave new world, variously arguing that they're putting them out of their misery, that they're an economic burden to the state, and that they cannot allow 'harmful' genes to proliferate. The architects of this policy anticipated opposition to the systematic murder of children, so told the parents of disabled children that they were being cared for, covered up that they'd been gassed and burnt, and falsified death certificates. Stephen Unwin's All Our Children dramatises the bureaucracy behind this horrible machine. It's set in 1941, and takes place entirely within the cosy, wood panelled office of Dr Victor Franz (Colin Tierney), Chief Paediatrician at the Winkelheim Clinic, near Cologne. Dr Franz has the pragmatic air of the experienced physician, comfortable in his skin and confident of his experience. He's assisted by his maid Martha (Rebecca Johnson), with whom he has the casual back-and-forth that comes with old colleagues. Were these normal times, Dr Franz would spend his time caring for his young patients and doing his best to ease their various discomforts. But these are not normal times. Newly arrived at the clinic is SS man Eric Schmidt (Edward Franklin) - a Nazi fanatic eager to bloodily realise Hitler's utopia. And so an unhappy Dr Franz spends his days choosing which of his patients to dispatch to the gas chambers, each signature chipping away at his soul and his perception of himself as a 'good man'. Over the course of the play, his self-deception is gradually demolished, first by an angry parent (Lucy Speed) demanding to know what's become of her son, and then by the visit of Bishop von Galen (David Yelland), who argues for the basic sanctity of life (and you know you've screwed up when the Catholic Church is lecturing you on mistreating children). But All Our Children isn't just a furious condemnation of Nazi atrocities. Throughout the play Unwin returns to the concept of a citizen's financial worth to their society, with his Nazis brandishing figures that 'prove' a disabled person is a net drag on the state's funds, arguing that money allocated to them could be used to benefit the best and brightest. By the time the characters are talking about 'scroungers' the play becomes a none-too-subtle allegory for austerity politics, through which politicians assign blame for economic woes on those least able to defend themselves. This is why we're taught to hate and fear the desperate refugee, the disabled person claiming state benefits, or simply those temporarily without work. Meanwhile, the politicians, economists, bankers etc who're actually responsible for economic misery skate by in a cloak of invulnerability - at worst suffering a slap on the wrist. It adds a further layer of anger onto an already furious theatrical experience. The Jermyn Street Theatre is a compact, claustrophobic place, making the audience feel hemmed in with the characters. This, coupled with the beautifully low-key realism of the staging and performances, beats out a steadily increasing rhythm that held me rapt for its 100-minute runtime. It's an excellent play that rarely puts a foot wrong and honestly, it's refreshing to see a straightforwardly realistic presented and mature of drama that doesn't call attention to its own artifice. I hesitate to say that All Our Children is enjoyable: I left feeling shaken and deeply uncomfortable. But then a play about the state-sponsored murder of disabled children shouldn't be enjoyable. Highly recommended. 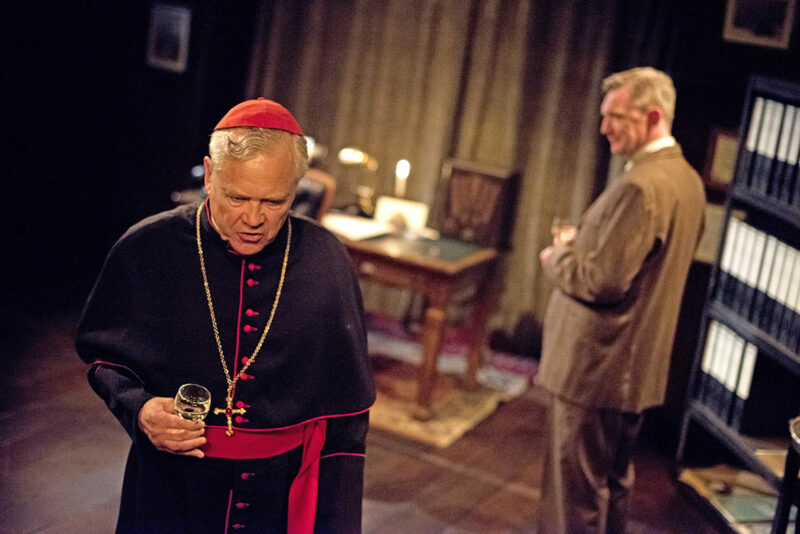 All Our Children is at the Jermyn Street Theatre until 3rd June. Tickets here.